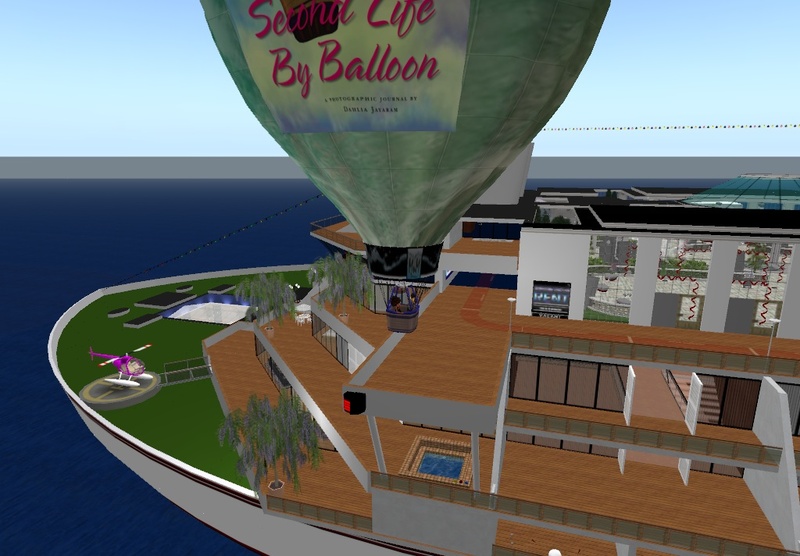 One thing about Dahlia Jayaram, she loves Second Life Adventures. Should you choose to interview her you will be doing it from a hot air balloon. Dahlia completed the tour of the Blake Sea and Island communities in January and February. It's her favorite location because of the beauty of the sims she passes. She flew us past one of the bigger airports in SL. I leaned over carefully, not afraid of heights, just sim crossings. "My first adventure was the Great Sailing Adventure in late 2009. It went from August to October of that year," she said while we hovered over Hollywood Airport. "I sailed from the southeastern most aspect of the Blake Sea and Island Communities around all the connected continents. I sailed everyday for six weeks." Dahlia navigated the hot air balloon south toward Fort Sumpter stating that this was a very active travel area and that the Blake Sea was created for this reason. She began her balloon adventure in Jan. 2010 after finishing the sailing adventure in Oct. 2009. As we fly over a popular pirate hide-out she jokes about the cannons facing toward the sea and that the pirates never thought about an attack by air. She navigates the balloon NW at speed 5 and tells me that like her sailing adventure, she'll write an Second Life book that covers it all while she continues her exploration on with the seventh continent of Corsica. She's written seven adventure books already. 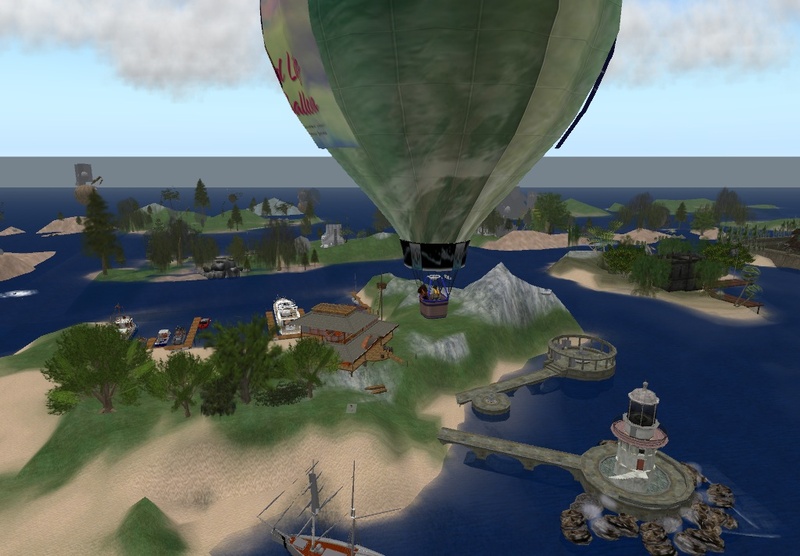 "Have you ever seen the 3-sim long sailing boat, the SS Galaxy," she asks me, while directing the balloon southeast. "There are wedding chapels, exercise rooms, ballrooms, rental cabins, retail, helliports and I can go on." Dahlia informed me that others have been inspired to have similar adventures. She considers that a great compliment and is happy that she's encouraged others to open their eyes to see beyond their usual boundaries. Dahlia notices storm clouds and lightning ahead. She cautiously changes her hot air balloon's speed. 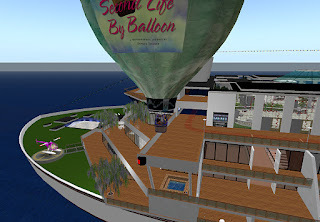 She tells me that after her sailing adventure, she wanted to find a way to include all of Second Life's regions that the sailing one could not. This is because not all continents are connected by a common body of water. We hear the thunder as we enter the Temasek sim and we're hovering over the SS Galaxy again. A few sim crossings force me into the sea and we seek a more secure area to continue our conversation. "The balloon adventure began Jan. 1, 2010," she begins to explain. "Because the Great Sailing Adventure could only include five of the 11 continents, I wanted to find a way to explore them all. Air seemed the next interesting way for me. I wanted to know more about the development of SL, so I wanted to start at the very oldest/first sim ever made and then fly to each continent in the order of their creation." She considered it would make a natural progression. While she was still in the middle of one of the continents, a new one was created. It was established for new residents who wanted a free house and was named Nescera. She anticipates her balloon adventure will be completed by the end of 2012. She has six more continents to explore. What's next? Maybe a long distance swim. She's not sure.